Are you looking for a way to preserve your favorite memories in style? Maybe you want to decorate your living room with a little color and personality. Check out our stunning line of canvas prints and spice up your home’s interior with your fondest memories! We offer a variety of different canvas styles and dozens of canvas sizes to customize your order to your specifications. Create a photo canvas to brighten your decor with color and a cherished memory! If you have a favorite photo that you want to turn into a canvas print, don’t forget about making copies! Order wallet size photos so that you can add your cherished memory to your favorite album or distribute them to friends and family! With our user-friendly project builder, you can create the canvas print of your dreams with ease. Just gather your photos and upload them to MyPix2 to get started. In no time, you’ll have a stunning canvas photo print ready for ordering! Get your canvas started by uploading your photos to MyPix2 from your computer or smart phone camera roll. Afterwards, choose a canvas style and size that fits your photo. Select from either a portrait or landscape orientation. Then, simply drop your photo onto the canvas in the project builder and position it to your liking. Review your layout and place your order! Building your own photo canvas is both easy and fun. Once your canvas arrives, it comes ready to hang so you can add a dash of color and personality to your décor instantly. Design one for yourself or create one as a special gift for a loved one. Looking for affordable home decor that’s high quality and brimming with style? You can’t go wrong with a custom canvas print. Design a canvas with a treasured photo and instantly update any drab wall in your home. Even though we offer cheap canvas prints at the lowest prices online, you won’t have to sacrifice quality for affordability. All of our canvas prints are made from genuine artist canvas and are either professionally wrapped or framed to give your home that sophisticated look you’re going for. 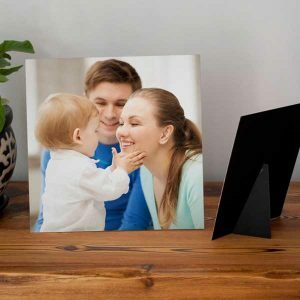 Upload a photo, create a custom printed canvas and brighten your decor without breaking the bank! No matter your décor, our canvas prints are guaranteed to look stunning on any in wall in your home. Just select a favorite photo and choose from a wide variety of options to display your pictures just the way you like. Preserve your favorite memories on canvas while adding a boost of color and character to your daily routine. Whether you have a striking wedding photo, a beloved vacation memory or simply a fun snapshot of your pet, create a photo canvas to preserve it and decorate your home with personality. Maybe your living room has a more modern look and you’re looking for a simple, elegant piece of wall décor to dress up your walls. Our custom wrapped canvas will give any living area a sophisticated gallery like feel while adding character to the look of your home. Perfect for any focal wall, our classic 24×36 canvas has professionally wrapped edges and will display any favorite memory in style. Hang it above your mantle or your living room sofa for added panache. It’s certain to make a statement that your friends and family will admire. If you want to dress up your bedroom décor with something a little more traditional, our framed canvas is sure to do the trick. Choose from black, walnut and white framing to go with the look of your bedroom and enjoy a favorite photo as part of your distinctive wall décor. Framed canvases are great for any look you are going for and are wonderful for displaying your fondest memories to their fullest potential. However you’ve decorated your home, a photo printed on canvas is sure to add a unique flair. 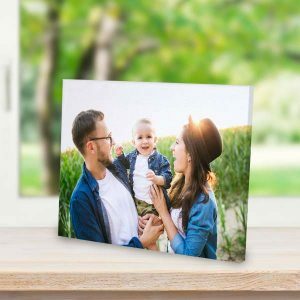 Perfect for wedding photos, vacation pictures or even just your favorite candid snapshots, your memories will be preserved and celebrated in style on our high quality canvas prints! With our various styles, you can even create a collage canvas to showcase a whole arrangement of your favorite memories. The possibilities are endless! Not only are our custom printed canvases great for photos, you can add your own text as well! Add a caption or date to your picture to bring your memories to life. You can also use our text feature to create a canvas with a favorite quote to brighten your home with personality. At MyPix2, you have all the custom options you need right here to make the perfect canvas that’s as unique as you! We offer several canvas styles that are perfect for not only complimenting your photos but your home décor as well. From gallery wrapped edges to our easel back canvases, you can display a canvas print anywhere in your home and showcase your most cherished moments or custom artwork for all to see. Our mini canvas photo prints are great for display on your living room end table and our large canvas prints can be hung on any focal wall. Whether you want to use a single photo or create your own collage, it’s sure to look stunning printed on our high-quality artist canvas. Many of us have dozens, if not hundreds of photos saved to our Facebook accounts. Browse your collection and preserve your best Facebook moments on canvas! You can use our photo folder to access and upload pictures directly from your Facebook account. Then, choose a canvas style and size, and have it custom printed to create stunning wall art! Whether you have a favorite picture of your friends or a cute snapshot of your pet, you turn it into a high quality canvas print that you and your family can enjoy for years to come! Our professionally wrapped edge gallery canvases are guaranteed to showcase your best photos in elegance. 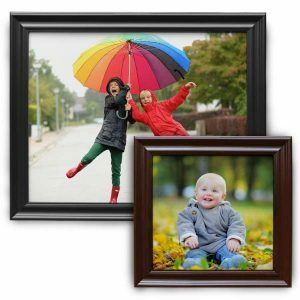 Choose from a variety of sizes including square canvas to fit your picture and the wall on which you want to hang it. Our gallery wrapped option is printed on quality artist canvas and stretched around a durable wood frame for a long lasting décor accessory that you’ll love. You even have the option of having your photo wrap around the edges or choosing a custom color for your canvas edges to compliment the look you’re going for. Choose between our 5×7 and 8×10 easel back canvas and instantly display your favorite memory on any side table, bookshelf or mantle around the house. Easel back canvases are perfect for filling up any drab corner of your home with a little color and personality. Even better, they are made with gallery wrapped edges for a sophisticated look that will go with any decorating style. Since they include both an easel and hanging hardware, they are completely versatile and can be displayed virtually anywhere. There’s nothing like a framed canvas to add a classic look to your wall art collection. Our framed canvas is available in 3 colors including black, white and walnut to perfectly fit in with any décor ensemble. We offer several sizes ranging from 11×14 to 20×30 so you can decorate a wall of any size and fill it with a cherished memory. Maybe you have a stunning family photo that you took during your last summer getaway. Upload it to MyPix2 and print it on a framed canvas to hang it in your family room. It’s sure to add a splash of character that your family and houseguests alike will appreciate. Our floater frame canvas combines the classic beauty of a framed canvas print and the sophisticated simplicity of a wrapped edge canvas. Just like our classic framed canvas you have the option between three floating canvas frames with three different finishes. Even better, your photo printed canvas will appear to “float” inside your frame for a look that is sure to please. Great for any connoisseur of modern design or simply to celebrate a great picture for all to enjoy, a floating canvas will look amazing no matter where you hang it. Do you enjoy looking through your family photo albums and taking a little stroll down memory lane? Maybe you want to display some of your favorite photos from your album to spice up your home décor. Why not upload a series of your fondest memories and create a collage canvas. We offer both gallery wrapped and floating frame collage canvas. Choose from dozens of background templates to compliment your collection of pictures and even choose a custom photo layout to give your collage canvas a distinctive look. When you can’t decide what photo to print on canvas, our collage canvas collection is certainly the way to go! Do you have an elegant frame that’s sitting empty in storage. You can make your own collage poster instead printed on matte photo paper! Are you looking for cheap canvas prints that don’t sacrifice quality? Look no further than our Canvas Lites! 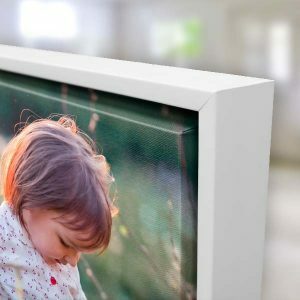 Printed on quality artist canvas with a durable flexible easel backing, our Canvas Lites are perfect for showcasing your most treasured digital images anywhere around the house. Set them up on an empty shelf or decorate your bedroom end tables with memories. Canvas Lites come in several sizes. Order a 4×6 canvas print to brighten an empty spot on your bookshelf. Or, add a little color to your fireplace mantle with our 8×10 option. Canvas Lites are the easiest and most affordable way to enjoy photo canvas prints with the best printing results. Whether you’re looking to show off your photos as wall art or create a unique gift for someone special, our custom canvas prints come in an array of sizes and styles that are guaranteed to please. Just upload your photos to MyPix2 and let our convenient project editor allow you to create your own custom canvas print in minutes. Highlight a favorite wedding picture on our floating frame canvas print or a cherished pet photo on our easel back canvas. Our canvas builder makes the design process simple! Once your canvas arrives, it is ready to hang and is sure to look great no matter which room you decide to decorate. Not only are our canvases elegant and stylish, but they will allow you to preserve your fondest memories for all to enjoy, year after year.